###What We&apos;ll Build When building an application, we often need to set up an access control list (ACL). An ACL specifies the level of permission granted to a user of an application. For example a user John may have the permission to read and write to a resource while another user Smith may have the permission only to read the resource. The Laravel-Permission package is built on top of Laravel&apos;s authorization features introduced in the 5.1.1 release. Although there are other packages that claim to offer similar functionalities, none of them have the same level of activity and maintenance as the laravel-permission package. user_has_roles: Also a pivot table, holds relationship information between the roles and the users table. user_has_permissions: Also a pivot table, holds relationship information between the users table and the permissions table. The methods assignRole, hasRole, hasAnyRole, hasAllRoles and removeRole can accept a string, a Spatie\Permission\Models\Role-object or an \Illuminate\Support\Collection object. The givePermissionTo and revokePermissionTo methods can accept a string or a Spatie\Permission\Models\Permission object. Before working on these controllers let&apos;s create our authentication system. With one command Laravel provides a quick way to scaffold all of the routes and views needed for authentication. After running this command you would notice two new links for user login and registration in the home page. This would provide the same functionality as before but now you don&apos;t need to write the bcrypt function when dealing with the password field in subsequent controllers. Do the same thing in the LoginController.phpfile. Since the HomeController has been deleted our users are now redirected to the home page which would contain a list of our blog posts. You can now check the database for the post table and columns. Now let&apos;s generate our resource controller. Here the Post class was imported from our model and the Auth class which was generated with the make:auth command earlier. These were imported so that you would be able to make Eloquent queries on the Post table and so as to be able to have access to authentication information of our users. In the constructor two middlewares were called, one is auth which restricts access to the PostController methods to authenticated users the other is a custom middleware is yet to be created. This would be responsible for our Permissions and Roles system. Next, index and show are passed into the except method to allow all users to be able to view posts. The index() method lists all the available posts. It queries the post table for all posts and passes this information to the view. Paginate() allows us to limit the number of posts in a page, in this case five. The create() method simply returns the posts/create view which would contain a form for creating new posts. The store() method saves the information input from the posts/create view. The information is first validated and after it is saved, a flash message is passed to the view posts/index. Our show() method of the PostController allows us to display a single post. This method takes the post id as an argument and passes it to the method Post::find(). The result of the query is then sent to our posts/show view. The edit() method, similar to the create() method simply returns the posts/edit view which would contain a form for creating editing posts. The update() method takes the information from the posts/edit view and updates the record. The destroy() method let&apos;s us delete a post. The / route is the route to our home page, here it was renamed to home The Auth route was generated when you ran the make:auth command. It handles authentication related routes. The other four routes are for resources that would be created later. Notice that this file extends views\layouts\app.php file, which was generated earlier by the make:auth command. Here the can directive checks if a user has the permission to Edit or Delete Posts, if so the Edit and Delete button will be displayed. If the user does not have these permissions, only the Back button would be displayed. Here the User class, the Role class, the Permission class and the Auth class are imported. In the constructor the auth middleware is called to make sure only authenticated users have access to the User resource. A custom middleware isAdmin is also called. This checks if the authenticated user has administrator privileges. This middleware will be created later. The index() method gets all users from the Users table and passes it to the index view which will display all users in a table. The create() method first gets all the Roles from the Roles table and passes it to the create view. This is so that Roles can be added when creating a User. The store() method saves the input from the create view, after validating the input, looping through the Roles that was passed in the form and assigning these Roles to the User. The show()method just redirects back to the users page as for this demonstration, we wont need to show each user individually. The edit() method gets the user corresponding to the id passed, then gets all roles and passes it to the edit view. The update() method validates data from the edit view and saves the updated name and password fields. It gets all roles from the roles table and while looping through them, removes any role assign to the user. It then takes the role data inputted from the form, matches them with the values in the databases and assigns these roles to the user. The destroy() method allows us to delete a user along with it&apos;s corresponding role. Three views are needed here: index, create and edit views. The index view would contain a table that lists all our users and their roles. The create view is just a form that allows us to create new users and assign roles to them. The edit view is a form that allows us to edit users and their roles. Using Laravel&apos;s form model binding the form is automatically populated with the previous values. In the store() method, we are making it possible for a role to be selected as a permission is created. After validating and saving the permission name field, a check is done if a role was selected if it was, a permission is assigned to the selected role. Three views are needed here as well. The index view would list in a table all the available permissions, the create view is a form which would be used to create a new permission and the edit view is a form that let&apos;s us edit existing permission. A middleware called clearance was also included in our PostController. This middleware would check if a user has the permissions Administer roles & permissions, Create Post, Edit Post and Delete Post. The Owner role does not have permission to Administer Roles & Users hence the exception is thrown. Now if you logout and view the post only the Back button will be available to us. This also works if you have a logged in user who does not have permissions to Edit or Delete Post. 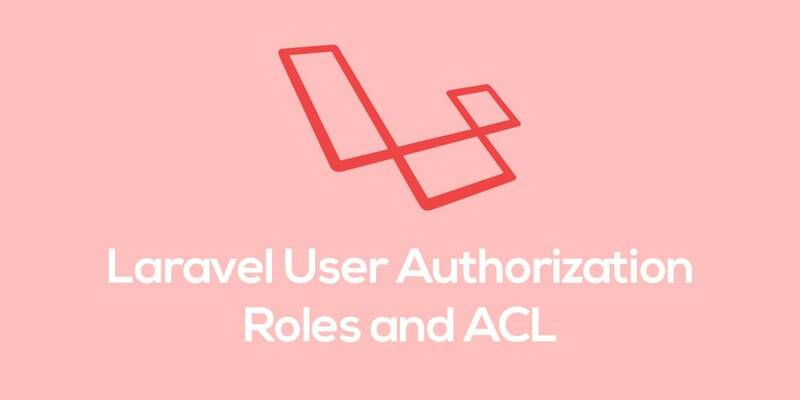 The laravel-permission package makes it relatively easy to build a role and permission system. To recap we have considered installation of the laravel-permission package, laravel-permission blade directives, creating a custom middleware and implementing an access control list in a Laravel application. You can look at the final product on Github and if you have any questions or comments, don’t hesitate to post them below.